Learning to eat Korean takes time, and I’m not even getting into table manners and customs. 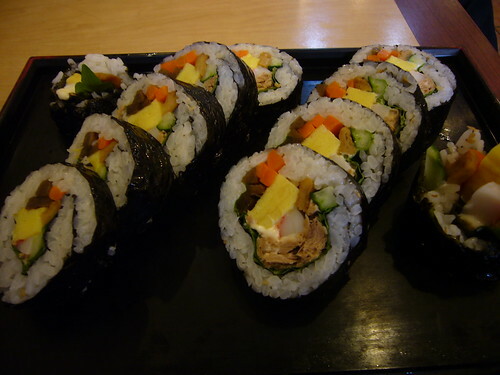 My first foray into the world of gochujang studded delights were the cheap diners, kimbap nara, kimbap chunguk, where back lit stylized photos of dishes strengthened my confidence. 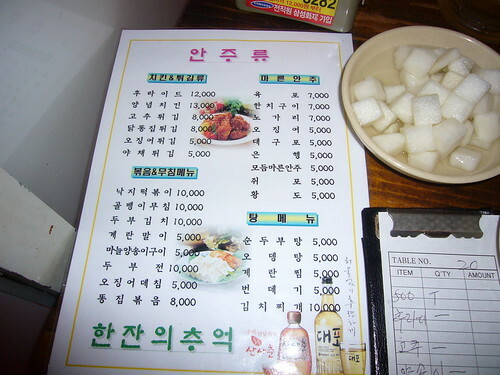 But when Kevin and I started hitting the gabli joints we suddenly had to read the menus, searching out familiar words. Would we be able to get mandu (dumplings?) “Do you think they have ddokboggie?” I’d ask hopefully. Eventually the vocabulary came, if I couldn’t properly translate the prefix, I could at least recognize the suffix, generally a cooking verb. Learning these few cooking verbs and nouns can help whether you find yourself at a Korean restaurant in Bellevue or a Kimbap nara in Masan. Bap: Rice. Unlike Chinese restaurants, one does not order a side of rice. Rice does accompany dishes like Kimchi stew (jjigae) and is a base in dishes like Bibimbap– mixed rice, or kimbap– rice wrapped in seaweed (kim). Bokkum: Stir-fry. Here is an easy one: Bokkumbap. Fried rice. Or in early spring when it is baby octopus season in Korea, nakjibokkum. Gui (Goo-y): Broiled or Grilled foods. 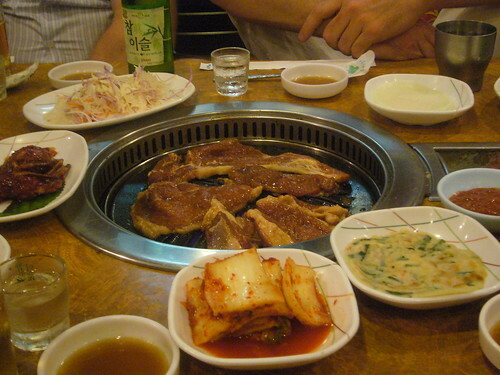 Korean cuisine is synonymous with grilled meats and seafood. Most are marinated though some, such as many of the fish dished are grilled with a simple dash of salt, through they won’t all include the suffix gui. The names of these dishes are based on the main ingredient: Galbi, grilled short ribs. Gooksu/kuksu, myeon: Noodles. But don’t get too excited. The word noodle is about as prevalent as the word pasta in the west. 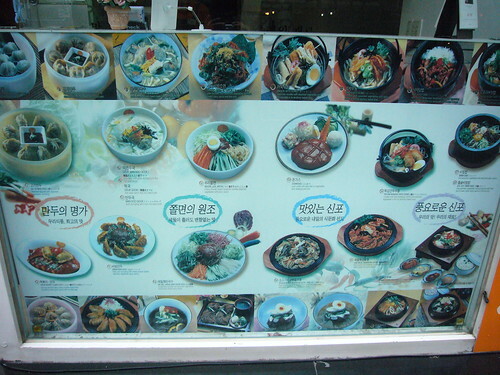 These are dozens of noodles and noodle dishes in Korea and not all of them include the identifying word. The most popular noodles in Korea are made from both buckwheat (like Japanese soba noodles) and regular wheat flour. There are thick hand cut noodles and thin white somen style noodles. The only noodles that are stir fired in Korea (to my knowledge) are ramyeon (ramen), udong (udon), and the transparent sweet potato starch noodles (dangmyeon) used in chap chae. Some delicious noodle dishes include Kal guksu– hand-cut noodle soup with various veggies and kimchi. My favorite continues to be mulnaemgmyeon– cold noodles in soup with brisket, sliced pear, and a hardboiled egg. Gook (Kuk), Tang: Soup. 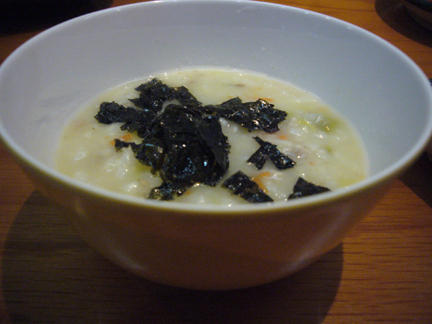 Soup accompanies most all meals in Korea, from humble seaweed soup to cures for hangovers that include fresh cow’s blood. What has to be the most popular soup is Samgyetang– a young chicken stuffed with rice, dates, and ginseng. What is the difference between gook and tang? The Korean Food Guide notes that the suffix tang refers to soups that have been simmered over low heat for a long time. Hwae/hoe: Raw. 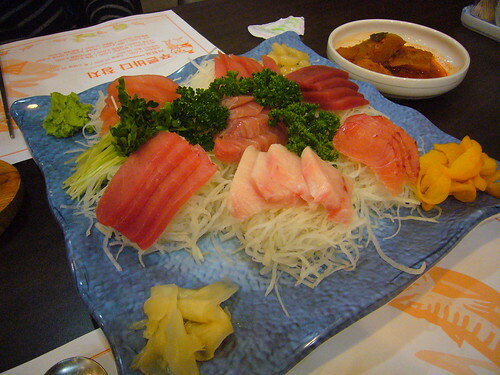 Hwae generally refers to raw fish, cut like sashimi, and sans the rice, but yukhwae is a raw beef dish, similar to steak tartar. 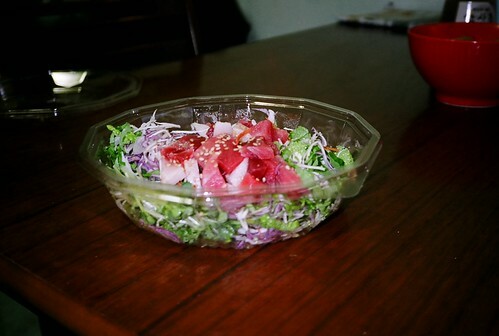 One of my favorite summer dishes Hwaedapbap is chopped raw fish atop sliced veggies on rice with a spicy chili sauce. Hwae-raw fish bap-rice. Starting to get it? 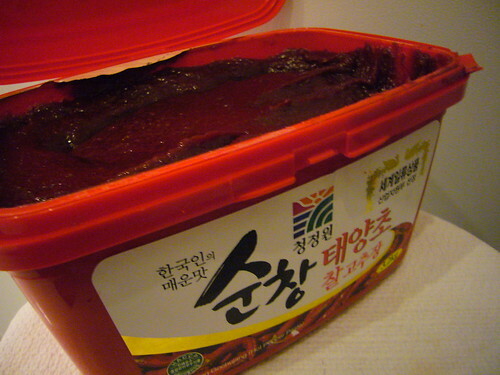 Jang: Jang translates into sauce. Korea’s infamous fiery chile paste so dear to my heart is gochujang, and then there is the mandu dipping kangjang, or soy sauce. 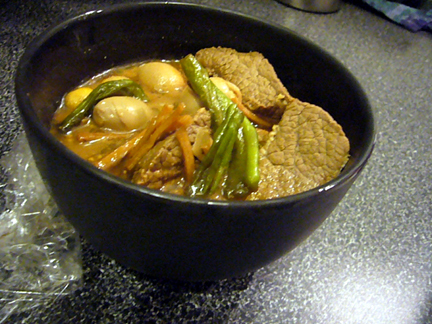 Jeonkol/Chongol: Hot Pot. 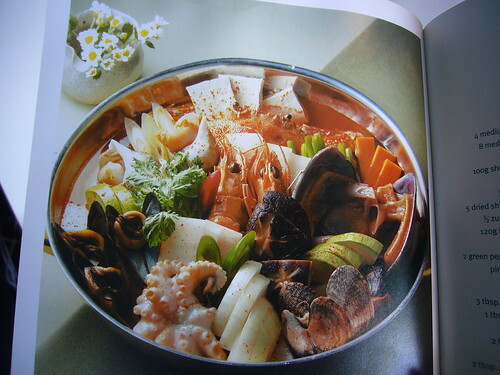 Darn near all the North Asian countries have some sort of one pot hot pot dish. In Japan it’s oden. One type found in Korea is dubujeonkol, or tofu hotpot, a collision of sliced tofu, ground beef, bamboo shoots, green onions and more. Jjigae: Stew: Kimchijjigae, or kimchi stew, is a bubbling cauldron of tantalizing spiced (ok, usually just chili), chock full of its star ingredient. Served rice they usually accompany larger dishes like bulbogi or galbi, but are often eaten on their own. 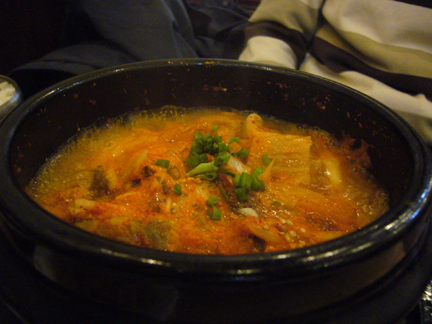 Jjim, jolim: Casserole, steamed or braised dishes. 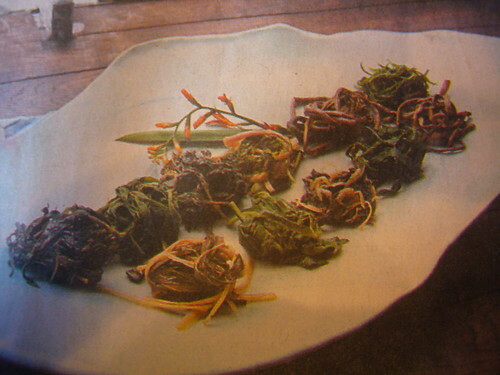 Kablijiim, casserole of short ribs, dates, mushrooms, carrots, and gingko nuts, is one of the top 10 must eat Korean foods. Jook: The literal translation of this word is gruel but don’t let that put you off. Think instead of a thick porridge, made from grains steamed over low heat, peppered with everything from minced abalone to pine nuts and dates. 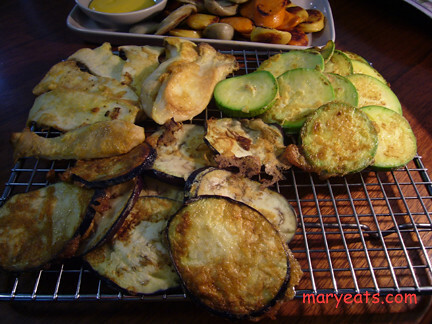 Panfried vegetables above and pan fried vegetable cakes below, examples of jeon. Jeon/Chon: Pan fried, mostly referring to cakes, and vegetables that have been dipped in flour then coated with egg. 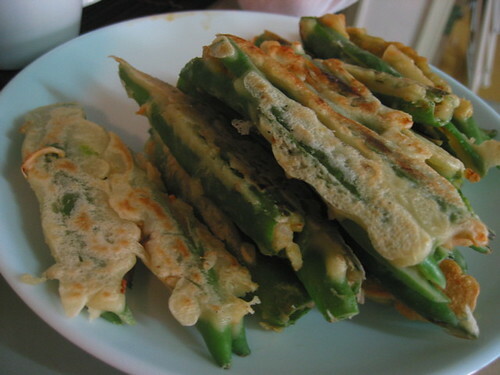 One of the more recognizable jeons is pajeon, a green onion pancake that accompanies some meals as bancheon. 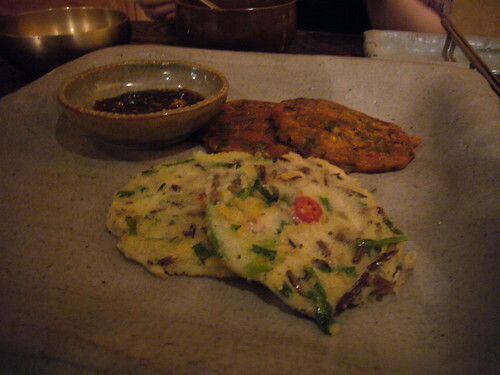 During the plentiful squash season, it is common to find hobakjeon, sliced zucchini battered in egg and pan fried, on the dinner table. 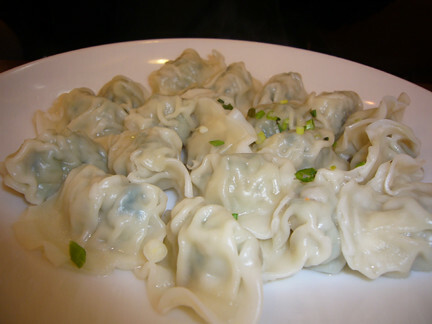 Mandu: dumplings. Korea’s answer to pot stickers and gyoza. I’m a diehard fan of the kimchi variety. Another favorite manduguk- dumpling soup. Namul, arranged elegantly on a serving dish. The orginal Korean hippie food? Namool: Weeds. Ok, before you start thinking, weeds? Who eats weeds? I think of namool as herb like vegetables, smaller greens and sprouts, gently sautéed with the sometimes addition of sesame oil or soy sauce. Generally served as a side dish, some vegetarian and health conscious restaurants in Korea turn a sampler plate of rare foraged treats into a main dish. Twigim: Deep Fried. For purposes of familiarity, twigam can be compared to the Japanese tempura, but the main difference is that twigam is a heavier, heartier batter than its neighbor across the sea. At any one of Korea’s ubiquitous pojangmacha, street vendors, you’ll find plates of mandutwigam (fried dumplings), or yachetwigam (deep fried vegetables) piled high ready for wandering snackers. Twigam is rarely served in restaurants in Korea with the exception of the occasional side dish, bancheon, but is finding its way on to North American Korean menus thanks to our affinity for all that is crispy. 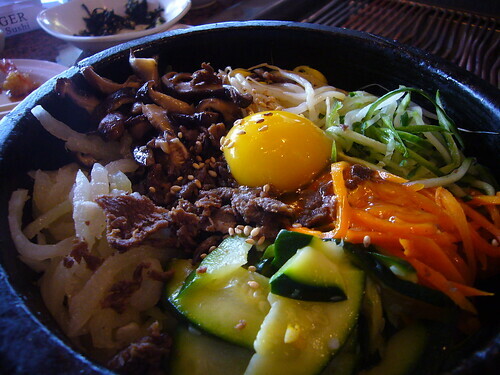 This is just an introduction into Korean cuisine, please feel free to give your 2 cents. Oh my goodness. That was cruel. I’m so hungry now. Yes, thank you, I’ll have 2 of everything! What a kind service you’ve provided. I was introduced to Korean food several years ago by a Korean friend who moved away. Not often able to splurge on dining out I’ve been teaching myself to prepare some of my favorites. It’s so much fun to shop Korean markets and discover “new” foods. They opened a Super H Mart nearby and I have to resist the urge to go everyday. Thats probably one of the best descriptions of Korean food I’ve seen. My mom would be proud of you! Gosh I’m soooo craving just about all that stuff in the photos. That was great. My mom is Korean and I grew up eating and kind of learning to cook the food. Everytime I go to the Korean grocery store or restaurants, I tend to get lost. The hardest is the sauces. The soybean paste that I use for the soup is one where I’m always trying to figure out the right one to get. Nice use of the archives! (Sighs) where does one begin. Should I comment on the lovely pictures or how hungry I am just looking at them. To live and never try Korean food is to never have lived at all. Even since I have been eating at Korean restaurants here in Bergen County, NJ I can honestly say that I will have a hard time ever going back to eating Chinese or Japanese again. Chinese is too American and Japanese isn’t as flavorful. A cuisine that is heavy on the pepper and garlic along with the alcohol(soju) should be a world renowned cuisine in my book. Nice entry… but where’ve ya gone, Mary? Thank you so much for this entry, Mary!!! I’ve been working my way through the menus of the local Korean restaurants with varied amounts of success. 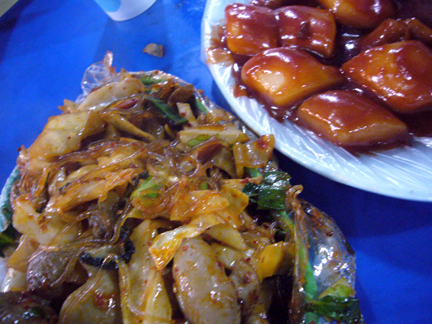 And I wanted to let you know that I had no problem obtaining kimchi bokkumbap and mandu on my last visit! Thanks again, this is a great blog! What a wonderful, informative piece. This will guide us in our Korean food forays. Am familiar with the food but not with all their names. Thank you much. I love your website. It has helped me in alot of ways. I have question about accessiblity in Korea? My boyfriend and I are deaf and speaking in korean language is out of the picture. Even reading their lips and trying to understand is too difficult. if i were to go to one of the restuarant, is it considered rude if i dont speak and just point at the menu (hoping its good one). Just how hospitable are they toward non-speaking deaf people? your website is really helpful!! Thank you so much for posting this on your site. Your knowledge of Korean cuisine is very impressive. About the manners: just show that you are open to trying new things and just enjoy yourself and most Koreans will think kindly of your manners :). Just keep in mind that eating is a very social event in Korea(chewing/talking with your mouth closed can get tossed out the window). Don’t hold back, eat like crazy!!! It’s a complement to the chef. Wow, this is great. I especially love the Batter and Deepfried Stuffed Peppers!